With the App Store containing close to 600,000+ apps, it is no surprise that a lot of software gets lost in the jungle and never makes it to the publics attention. With that said, apps that can bring new user experiences to the table are generally picked up on and quickly gain significant traction amongst iOS users, something that was particularly evident with the Clear app that offered a beautiful gesture based experience. 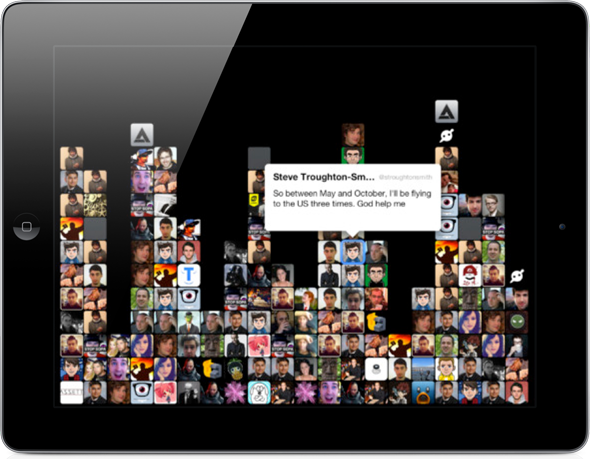 One of the latest apps to hit the iPad dedicated store is called Crest, comes from developer Adam Bell, and is billed as a Twitter timeline visualizer that offers users the ability to quickly glance at tweets from members they follow, viewing their public feed in a manner that we haven’t seen from other Twitter based apps yet. A lot of iOS users, specifically jailbroken ones, may know the developer from his Cascade and Nyan Cat Cydia packages, but like a lot of other iOS developers, he has also made his mark on the official App Store with a number of releases. Crest is the latest of those releases and implements Twitter in a different way to the standard table based timeline approach. Crest is an iPad only app that is constantly streaming live, meaning that whenever someone you follow posts a public tweet the app will pull that tweet into view by dropping it onto the screen, showing the users avatar and the tweet text when selected. The beautiful and unique implementation of the streaming feature alone is worth the $1.99 that it costs to own Crest, but the fun doesn’t stop there as the app also allows users to post to Twitter through the use of a simple right to left swipe gesture. Invoking that gesture will produce a new view that allows a tweet to be composed and posted to Twitter. When viewing the text of a public timeline tweet, invoking the same right to left swipe gesture will allow a reply to be posted. Crest also allows users to search through Twitter, something we would expect from a fully functional Twitter application. The search ability is started by tapping any area on the screen, which brings up a search field and any associated results as soon as the user has stopped typing. In a marketplace that is flooded with functional Twitter clients, Crest doesn’t bring any earth shattering new features to the party, but it is sure to stand out purely because it steps away from the normal idea of what a Twitter app should be and brings a powerful feature set bundled into a fun and unique interface that also has the added bonus of being fully Retina ready for the new iPad. The inclusion of an in-app browser, landscape and portrait orientation support and added features such as being able to view profiles and show or hide retweets makes Crest a must have Twitter application in my opinion. 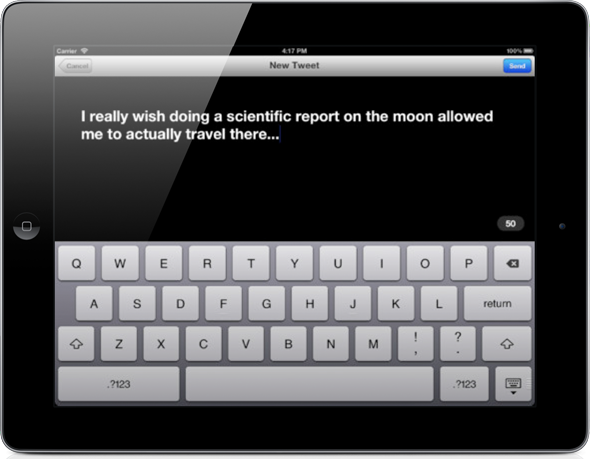 Crest is an iPad only application, available from the App Store costing $1.99 and requires iOS 5.0 or above. Download Crest for iPad [iTunes Link].